NATURE OF GROUP: Pro-bono guerilla public relations specialists operating under cover as “The Institute of Sociometry”. This report recently appeared in SHERBERT Issue 6. Download the original article designed by SHERBERT Publisher (and is agent) Dan Weiss. 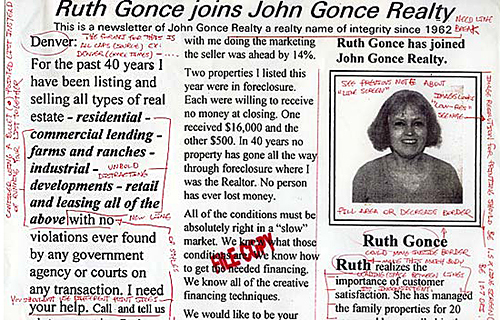 John Gonce, a Denver Realtor and perennial candidate for Denver City Council District 2, leaves unsolicited newsletters on the stoops and in the mailboxes of south west Denver Residents. Unfortunately for John Gonce, he did not seem to have the same level of publishing acumen that he was blessed with in areas of finance. Fortunately for John Gonce, several issues of The Gonce Times slid across the desk of The Institute of Sociometry. John Gonce’s grammar clearly begged for a copy editor. Ex: “For U.S. House of Representatives, Denver, we have in office Dianna DeGette. DeGette is so far to the left philosophically, if she went any further she would be in Hell. Where is Hell on this earth? For the past 100 years it has been in socialists and communists countries where ownership of real estate is often forbidden.” Since there were no copy editors on staff with The Institute of Sociometry, we assigned an IS agent specializing in design and commercial print publishing production to his file. If IS couldn’t help John Gonce with his message, we could at least spruce up his media. 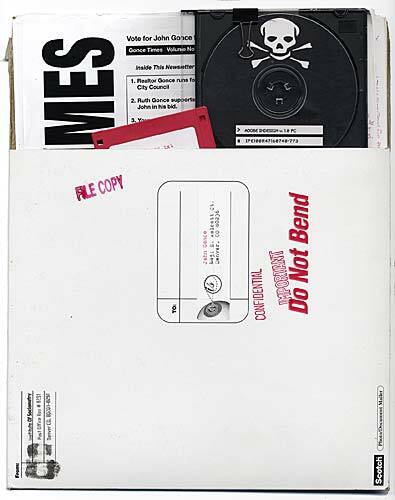 • A print out with specific instructions on installing a pirated copy of Adobe® In-Design™ v. 1.0 for Windows 95 – 98 – including a clean serial number. • A CD installer for Adobe® In-Design™ v. 1.0 for Windows 95 – 98. • A Red 3.5″ Diskette with our redesign of the most recent issue of The Gonce Times saved as an Adobe® In-Design™ v. 1.0 template. Since presumably receiving the mailer, John Gonce lost his City Council race. No more issues of The Gonce Times have since been distributed. We suspect that when John Gonce has finally mastered the Paragraph Styles Palette we will be seeing The Gonce Times with a fresh new look on the stoops south west Denver. Though mentions of John Gonce and his perpetual failed bids for city office were quite common in Denver media in the late 90’s into the early 00’s no reports are brought up via google post-dating our report. We are pleased to note that when googling John Gonce our original version of thIS report comes up 4th in the search rankings. Though intrigued, the initial email caught us at a busy time and we flagged it for later. We assumed the email was a press release for an award received by John Gonce and our past association with Mr. Gonce had landed us on an email list for Gonce related news. Revisiting the email, and corresponding link, a month later it became clear that this was an unfortunate mix-up. “Do I have to pay for an award to be a winner? “There is an error in my company information – how can I fix this? I am a public relations specialist who worked, in my capacity as a special agent for the Institute of Sociometry, briefly for John Gonce Realty in the mid-90’s on a pro-bono basis. In fact, Mr. Gonce never asked for our help, we simply ascertained that he needed it and, did the relevant work, and mailed him the related materials. We have not actually had any personal correspondence with Mr. Gonce and do not have his email address. 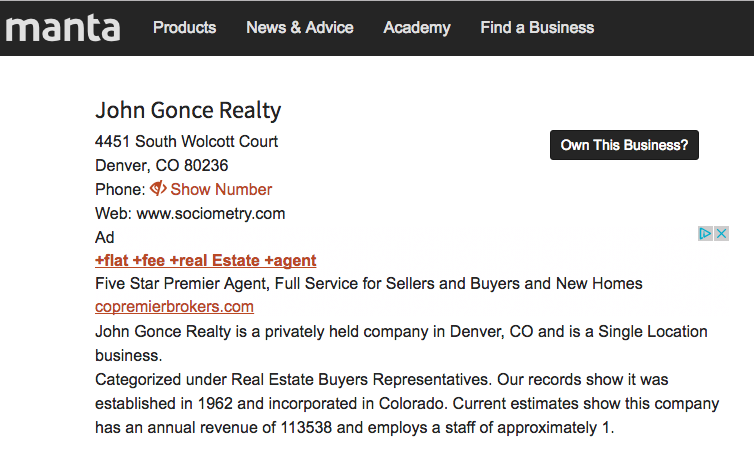 We have had a blog post regarding our work for Mr. Gonce on our website for some time and, consequently, our website has become associated – incorrectly – with John Gonce realty. Please take a minute to review the post titled “Correct John Gonce” as it will be relevant to our final query in this email. And please reply to this email to confirm you’ve done so. If we don’t hear in the affirmative by 08/01/17 we will laser print all of the above mentioned materials and send them to Mr. Gonce with a letter of explanation on your behalf. Also – in reviewing your award criteria and associated links we would like to be considered for the Denver Business Recognition Awards in the category of Public Relations or Marketing or Graphuc Design. This self-nomination is submitted on the merits of our pro-bono work for Mr. Gonce here and other more recent projects: see “WEDUPT” done for Denver Parks and Rec and “This Could Be Here” done – again in a pro-bono capacity – for Denver office of Planning and Development. 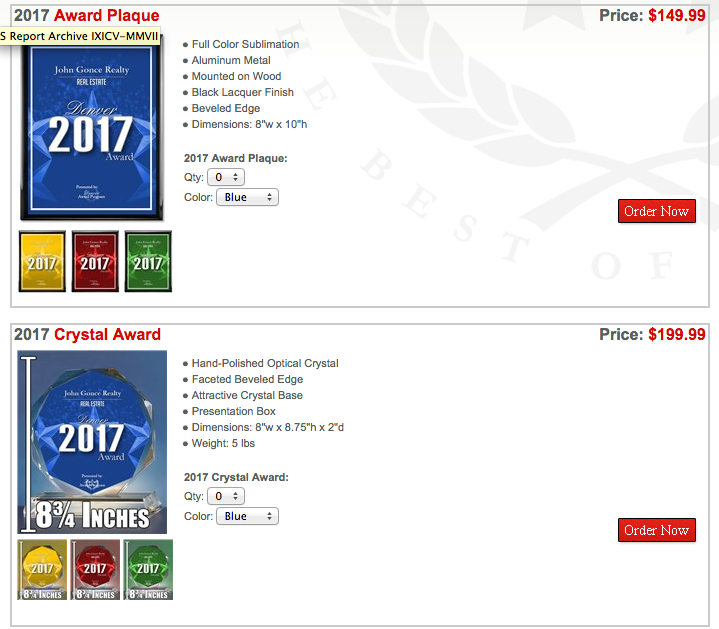 We look forward to your confirmation that you have sent these materials via post to Mr. Gonce and thank you for considering us for your award.